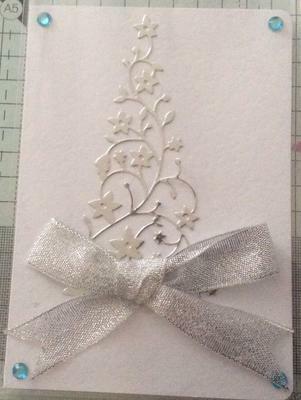 7 x 7 card, matted and layered Silver Miri card, embossed the white card with snowflakes. 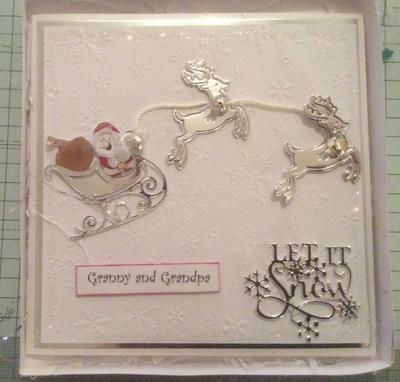 Die cut a sleigh, reindeer's and the Let it Snow sentiment for the bottom right hand corner. 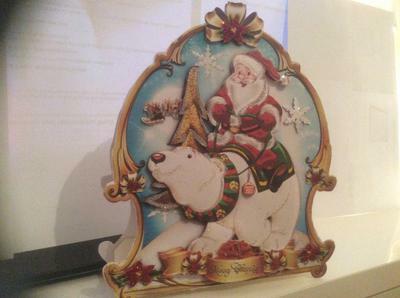 I used a Santa sticker and cut it up into separate pieces so that I could have Santa and his magic bag of presents separate on the sleigh. 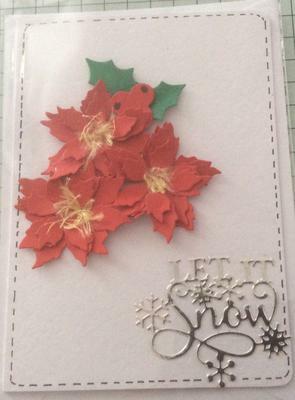 I have attached a further 2 cards which were very simple to make and only had a couple of die cuts for each of them. They are all 7 x 7 cards. I put all the cards into boxes that I had made. 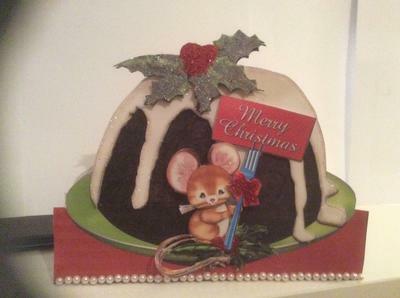 These cards were some of my quick Christmas makes, didnt take very long to make, but did the job for Christmas. I lost count of how many I made in the end. Each of the cards only used one die to make the finished product, but they all look very different. 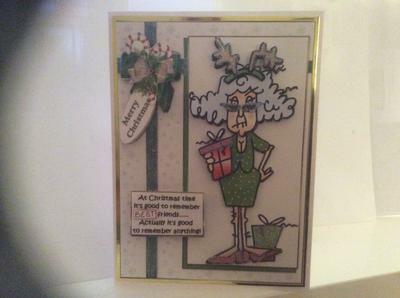 My goodness you have been busy ... not only making cards to send but adding them here in the gallery as well. All of these cards were made with Craftsuprint, which is a great site to buy loads of different cards through. You make them up to however you want your cards to look. 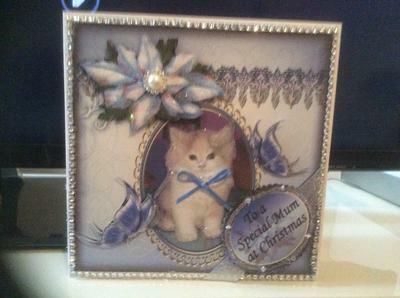 Again, if you don’t mind cutting out to have decoupage pieces, they really turn out lovely cards. 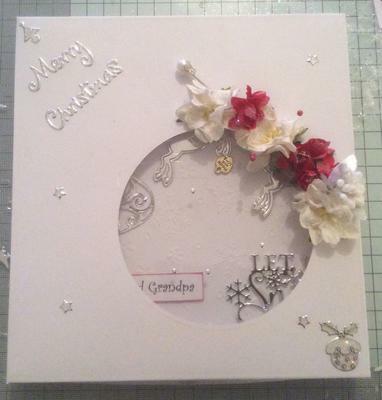 I have used glitter, glossy accents and other little bits and pieces on each of the cards. I made my own boxes for each of them to go into, I hope you like them. 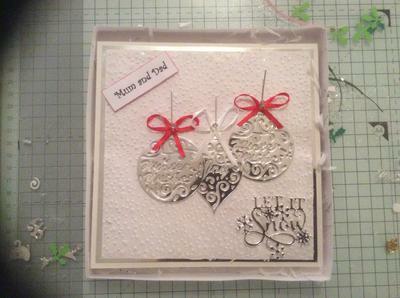 I love the shaped Cards Jennifer they look really special and all are individually finished. I made this Advent Train with the help of a file from Craftsuprint. It was relatively easy to make, but there was a lot of cutting out, so if you don’t mind that, you are definitely onto a winner. I used fluffy stuff for the steam coming out of the front engine, I used a bendy straw to stick the fluffy stuff onto. 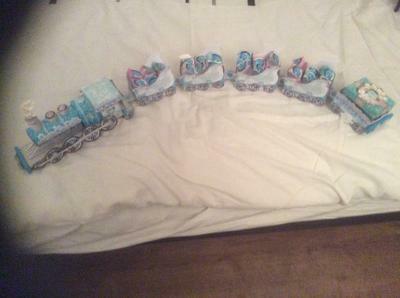 I used glitter on the train at various points and to finish off the train, I filled all the boxes that were in the carriages with soft jelly sweets. The train really went down a treat with the children I made it for, they were wanting to eat all the sweets at the same time. I matted and layered Silver Miri card with White card, then embossed the top white piece of card. I then die cut 3 baubles and attached them to my card with hot glue. 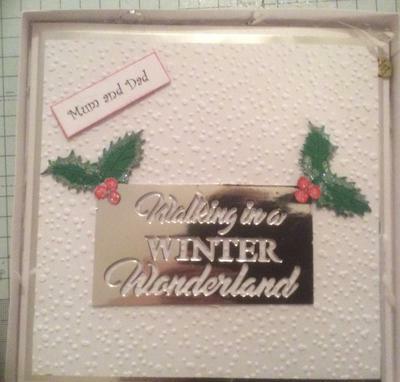 I die cut Let it Snow from Silver Miri card and also attached that with hot glue. I attached red and white ribbons to the top of the baubles. 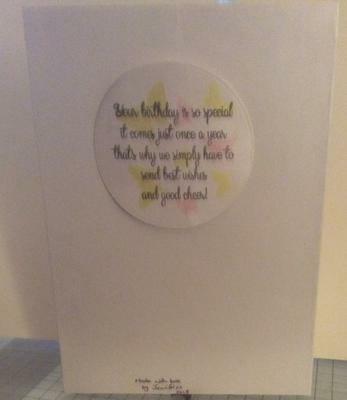 I also made a box for the card, I cut out a circle in the box to show off part of the card. I attached red and white flowers to the outside of the box. I have put 4 baby cards in this one post, rather than posting them all separate. The first one was a 7 x 7 card matted and layered with two different colours of blue and a piece of white card on top. Before I attached the white card, I die-cut a bottle from the card and put in a plastic bottle, which I glued at the back of the card to ensure it didn't move. Once I did this, I then put in some glitter and attached a blue piece of card to the back of the bottle. I then attached the white card onto the light blue piece of card. 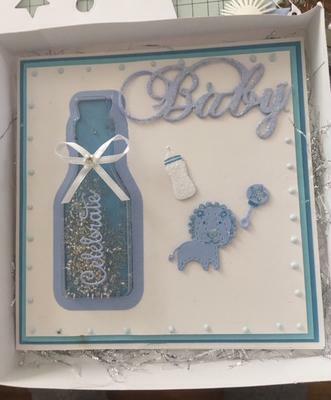 For the front of the card, I die-cut the Baby sentiment, Celebrate, a lion, a rattle and a baby bottle. I then coloured parts of these items with blue gel pen. I glued all the bits place with a hot glue gun so that it would give things a bit of dimension. 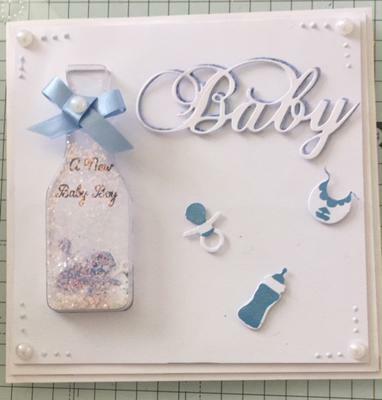 I then used Nuvo Crystal drops to put round the edges of the card, unfortunately, I have still not got the knack of putting these on straight. Any tips would be helpful. 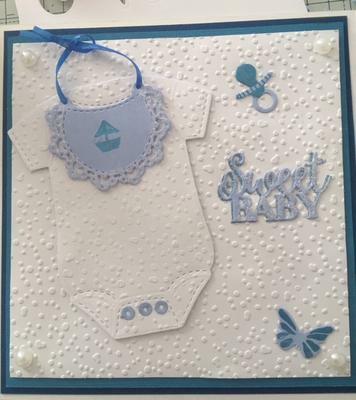 The second card is very similar to the first - another 7 x 7, however, I used a dummy, a bib and a bottle and die-cut out two Baby in blue and white card. I used 4 pearls at the corners and 3 Nuvo Crystal drops. The third card, you guessed it is another 7 x 7 card. Matted and layered with two pieces of different coloured blue card. 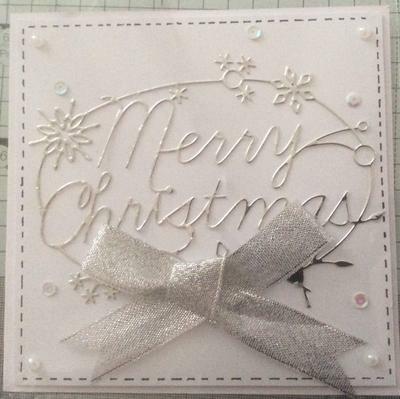 The top piece of white card has been embossed with dots. 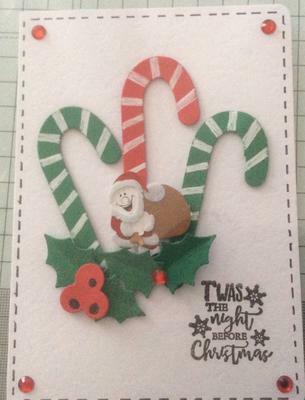 I attached all of the pieces to the card with hot glue to give it dimension. I coloured in some parts with blue gel pen. I also attached a piece of blue ribbon to the top of the bib, and 4 pearls at each of the corners. 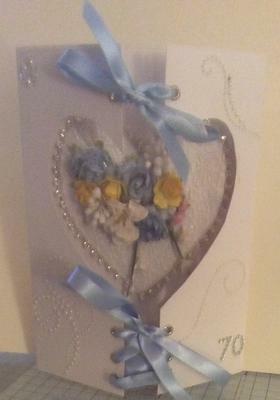 The fourth card is another 7 x 7 card, white on white, with the top piece of card being embossed with small hearts. 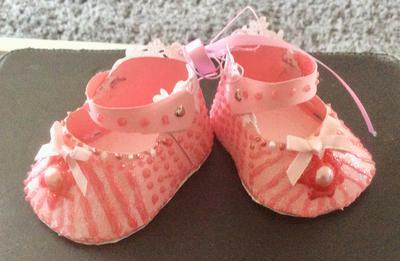 I die-cut the Baby sentiment and all the baby clothes. I then attached a small piece of string (as the rope for the washing). I then put black dashes round the outside of the clothes and attached them to the rope with small pegs. 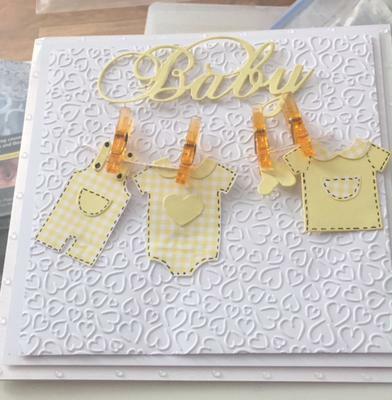 I hope that you enjoy the baby cards. This was a card that I made for a friend who had just got herself a new job. It is made from Craftsuprint. 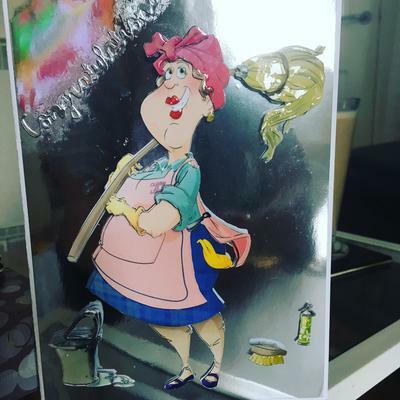 I cut out all the decoupage that was needed for the card, I used Glossy accents on the mop, lips and bucket. I die- cut Congratulations out of Silver card. I put it all together using hot glue to give it some dimension. Another 7 x 7 card, matted and layered with blue and white card, the white card has been embossed. 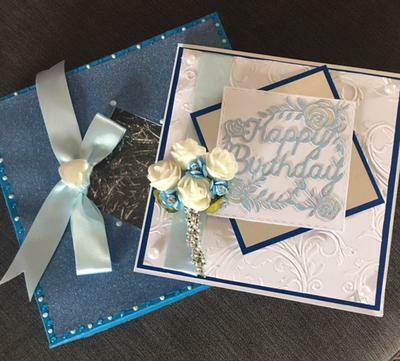 I then cut out two squares one in silver and one in blue to pur in the centre of the card (which I have now realised is not in the centre - OOPS) I then die-cut a Happy Birthday die which I had got free with one of my magazines. I attached pieces of silver card behind the roses and attached all the pieces to the top of the card. 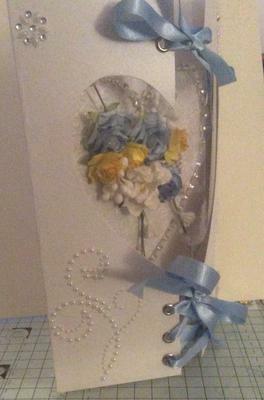 I then put a posy of white roses and blue flowers on top. I then made a box to put it in, with a blue ribbon and heart shaped pearl on top. I used Nuvo Crystal drops round the outside of the box. The mistake is only obvious to you ... the rest of us think it is lovely and would be more than happy to get a card like this. I followed all the instructions that Christina gave and I was pleasantly surprised by how my card turned out. 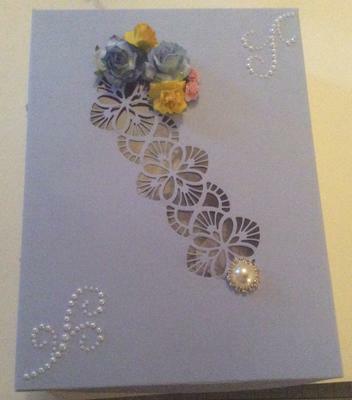 My friend likes blue and yellow, so I decided to go with that colour scheme, on the inside of the card I put a heart shaped piece of card, embossed with hearts and round the outside of the heart I used a length of sparkly diamonds. My friend will be wishing they were real, unfortunately not. On the outside of the card I used pearl swirls and a number 70 (in the corner), as I know she doesn’t want to be reminded too much of her age. I used blue ribbon to put through the eyelets, although I may change it to white as I am not sure of the colour. On the back side of the card, I die cut a circle and stamped the sentiment ‘Your birthday is so special it comes just once a year, that’s why we simply have to send best wishes and good cheer’. I stamped a couple of butterflies on the back of the stamped sentiment. 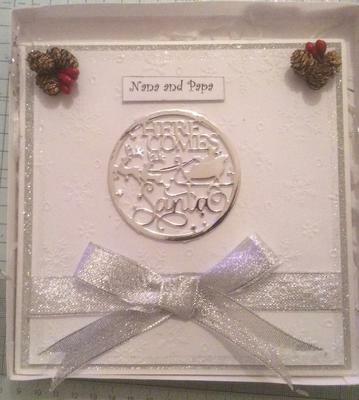 I also made a box envelope and used the Striplets - Ravello die to cut out the piece in the centre of the box. I used acetate to back the die, and used the same colour scheme for the flowers on the outside of the box. I know that my photographic skills are not the best, I just need to work on these. I have looked at these boottees on so many occasions and I never even tried, so as everyone near to me are popping out babies like smarties, I just decided now was the time. So I got my template, cut everything out and glued things where they were supposed to be. I then got started with my Nuvo Crystal Drops, glitter, gems, little ribbons and just played about. They are certainly not perfect by any means, but I was pleased with how they finally turned out. 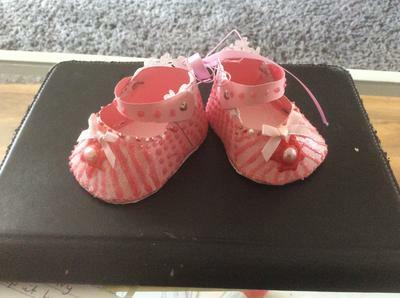 I gave this pair to my neighbours who have just had a beautiful, tiny little girl who they have named Emma.